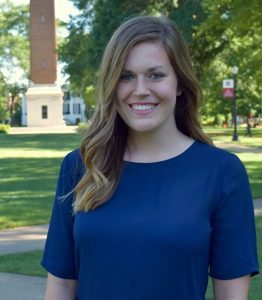 Alex Huechteman arrived at The University of Alabama with an idea of what she wanted to study, but the Honors College student soon discovered a path that would take her to Nicaragua to study a segment of rural population for the first time. A track and soccer athlete in high school, the Frisco, Texas, native started her academic career majoring in kinesiology with plans of physical therapy school in her future. But during her freshman year, she became intrigued by a different medical field. Huechteman selected public health because she loves to talk about various areas of health care, including epidemiology and patterns of disease, among others. She also had the opportunity to research one of today’s hotly debated medical topics. 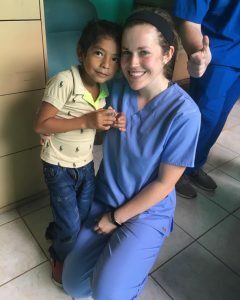 When Huechteman was a sophomore and Honors College ambassador, she saw a blurb in a newsletter about the Nicaragua Clinical Experience, an Honors College program that allows UA students to learn and serve at the La Clinica Alabama-Granada in Granada, Nicaragua. She immediately was intrigued because the program involved a combination of medicine, underserved communities and intercultural interaction. She was accepted into the program and lived with a host family for two weeks following her sophomore year. Huechteman’s days were split between working in the volunteer-run clinic in the morning and taking Spanish classes in the afternoon. At the clinic, she would shadow physicians, collect vital signs, monitor diabetic patients and help dispense medication in the pharmacy. And while Huechteman enjoyed her Spanish classes, she says the time spent with her host family allowed her to fully immerse herself into the culture. When she was able to apply, Huechteman quickly jumped at the opportunity to be a student facilitator, a role that normally involves assisting the program’s faculty leader with lectures and preparing students before their trip abroad, all while on campus. 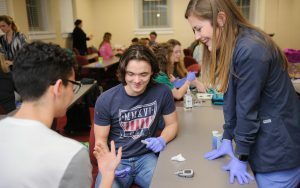 But not long after being selected, Dr. Ross Bryan, assistant dean of the Honors College, gave the group of three student facilitators a rare opportunity to develop a research project and travel back to Nicaragua. Huechteman helps prepare UA students participating in the Nicaragua Clinical Experience before their trip abroad. Due to the lack of health care information in rural communities like Granada, the group designed a community needs assessment based on a World Health Organization survey to better understand health behaviors, access to health care and demographics of patients visiting the clinic. While most of the research was qualitative, Huechteman said they added some thematic coding because most of the patients told stories. According to Miller, the student facilitators were the first team to conduct international research at the Nicaraguan clinic. After graduation in May, Huechteman will enroll in the physician assistant program at the Baylor College of Medicine in Houston. She chose the program because of its emphasis on health care for Spanish-speaking populations.